area. There were over 150 patented mine claims in the St. Elmo area. Populations reached a high of nearly 2000 people. The DSP&P laid their tracks up to St. Elmo and continued the line through Romley then to Hancock and through the Historic Alpine Tunnel. St. Elmo was considered a hub town for supplies arriving by train. The tracks were abandoned in 1922. 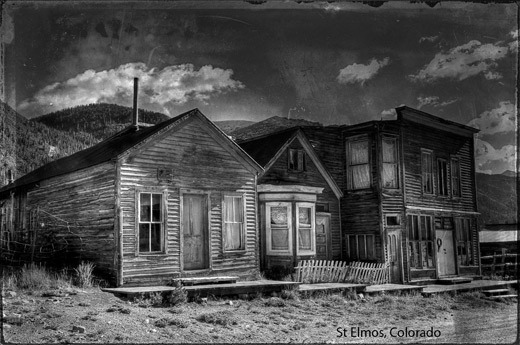 It is said that St. Elmo’s population rode the last train out of town and never came back. It is a wonderful ghost town to explore. One can almost hear the noise of the bustling mining town echoing from the mountainside at 10,023 feet elevation.